The University of Alberta’s Peel’s Prairie Provinces online database of Western Canadiana has many a fascinating item. (Incidentally, all available publicly for free without any subscription! Browse and cite to your heart’s content!) 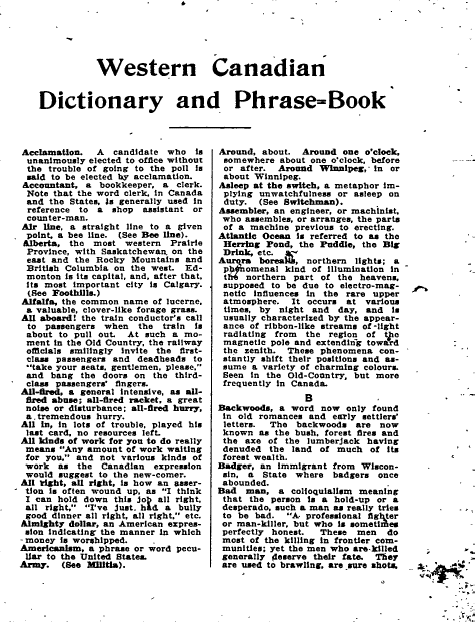 One among many is a fascinating dictionary for recent immigrants to Western Canada: Western Canadian Dictionary and Phrase-Book: Things a Newcomer Wants to Know (1912). At a bare 32 pages long, it still contains many phrases that are both familiar (“Skyscraper, a very lofty building“) and unfamiliar (“Skyscraper man, the name given to the workman, who performs the perilous work of erecting the steel framework of the skyscraper“) to modern readers and really demonstrate just how much the English language was in flux – and apt to confuse particularly British immigrants, the most appealing immigrants as viewed by the Canadian government of the era. 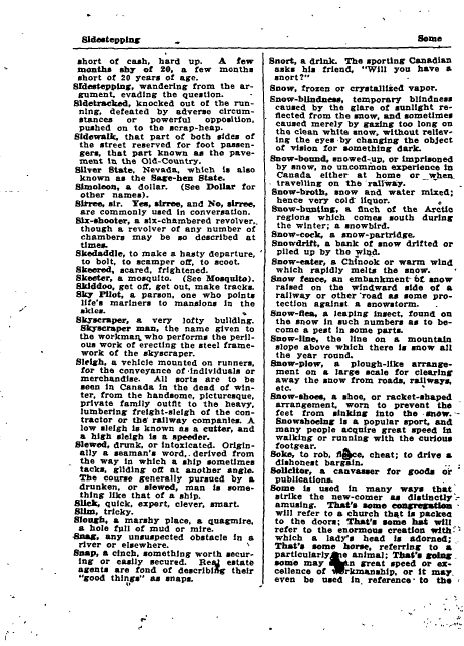 Many words and phrases have been absorbed into modern English but were clearly unfamiliar terms to those who had never experienced, say, a Canadian winter (“Sweater, a woolen jacket, much work in Canada during the winter both indoors and outdoors, and sometimes a somewhat gaudy article of wear.”) This dictionary even sheds light on terms so basic I think nothing of saying them fifty times a day: “Sure, a common expression, meaning ‘of course’ or ‘certainly,’ and used much the same as it is used in Ireland, though Canadians will resent the suggestion that the expression if of Irish origin. 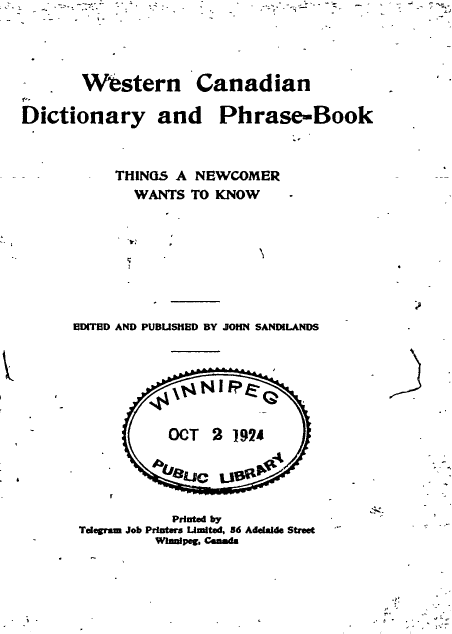 Sure thing means ‘that’s a certainty‘.” A fascinating resource on Western Canadian English! Edwardians Imagining a World in Which Women Voted… And Are Free to Act Like Men in Bars?